Where are you going? Oaxaca? Why???? Yes I got a lot of perplexed faces when I told people I was going to Oaxaca, Mexico. Maybe if they saw it on paper, “OAXACA” they’d at least have a clue. But it’s pronounced “Wa-Ha-Ka”. So no, I’m not going to Huatulco, which is where the travel rewards agent originally booked my flight to, nor it is Osaka, which is where my mother in law’s luggage ended up, (last year). Oaxaca is south of Mexico City and inland. No beach? Why would I go to Mexico and not to the beach? Well, Oaxaca is a wonderful city that’s the Unesco World Heritage list. The art, culture and people here are amazing. And since it’s Mexico, yes there’s warmth too. But above all, my reason for coming to Oaxaca is the food. The food in Oaxaca is amazing. It is a highly developed and sophisticated cuisine, eaten at fancy restaurants, market stalls or food carts. Like a lot of my food travels, I was first introduced to Oaxacan food from an episode of Anthony Bourdain’s “A Cook’s Tour”. This was back in Anthony’s skinny days, where his show was less produced and he seemed more genuinely passionate about the food he was eating. I saw images of grilled chorizos, colourful dried chiles, and learned about this wonderful thing called mole. It got put on “the list” that moment, and luckily was taken off quite quickly. Ben’s parents spend some of the winter in Oaxaca each year with friends. A couple of years back, Ben and I came for a visit for a week and I was enamoured by the food. This year, with vacation days still left to be used, I cashed in some points and put myself on a plane to Oaxaca to re-visit some favourite tastes of my past trip and to search out new ones. At this point, I’ll take the time to introduce the “characters” in my adventure as I will be spending the next 10 days with them. My in-law’s are Henry and Jo, who I’m pleased to say remembered to pick me up from the airport. Their friends are Tom and Molly. I am happy they all enjoy eating and are putting up with my mainly food-focused adventure. I will rely on them for my food choices as well as other things to do in-between eating, (like go to the stamp museum and a walking tour of catholic churches so far). I’m very excited about some of the eating I will be doing over the next week. So far I’ve sat in the kitchen while our cook has prepared a meal for us and tomorrow I go out to how learn to make tamales. I can’t leave this post without sharing a bit of the food that I’ve tasted in Oaxaca thus far, I’ll tell you about the dinner I had last night. 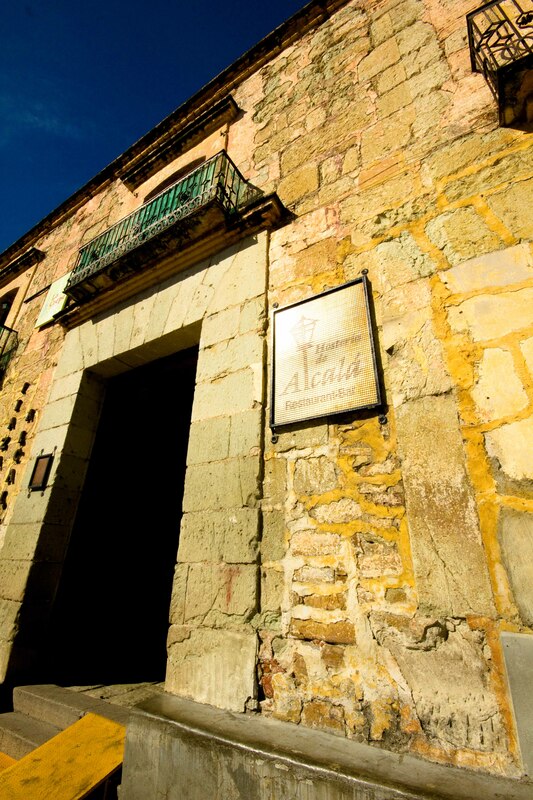 After a few failed attempts of choosing a restaurant that’s open late-enough or on a Monday, we ended up at Hosteria de Alacala. The restaurant was lovely with an open covered courtyard which I assume is uncovered in better weather. Like most restaurants in Oaxaca, we were one of 3 tables of people dining. My first of what I hope to be many margaritas here. 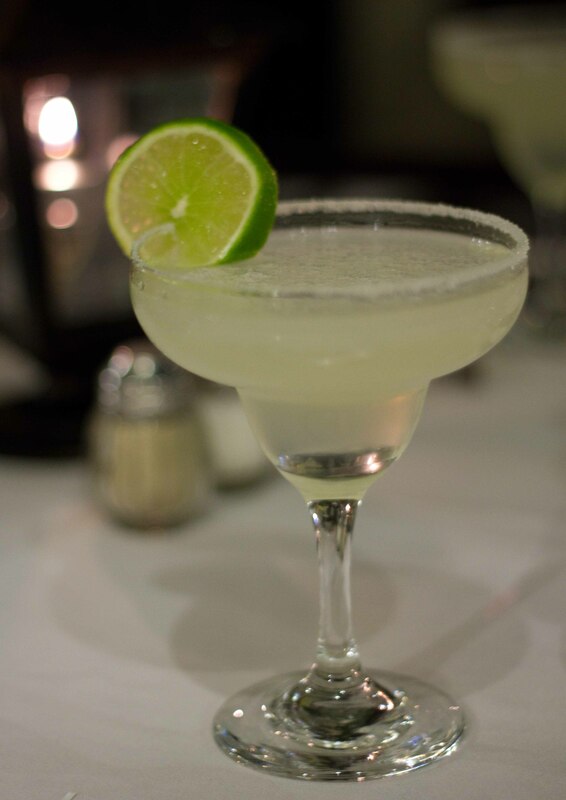 A good lime margarita is so hard to find at home but here it’s not. And to add to that, I think the standard of good in Oaxaca is even higher, so I can’t wait. For my first dinner in Oaxaca, I shared a Botana Oaxaqueña which is basically a “best of” with Jo and Molly. I enjoyed the 2 cheeses, the fresh queso and traditional Oaxacan string cheese quesillo. The shredded pollo stuffed chiles rellenos were very delicious as were the tasajo, (thin grilled beef) and the cesina, (chile rubbed grilled pork). In the center is a nest of chapulines (grasshoppers) which I’ve had crunchy and whole before, but these were soft and shredded and tasted of lime. 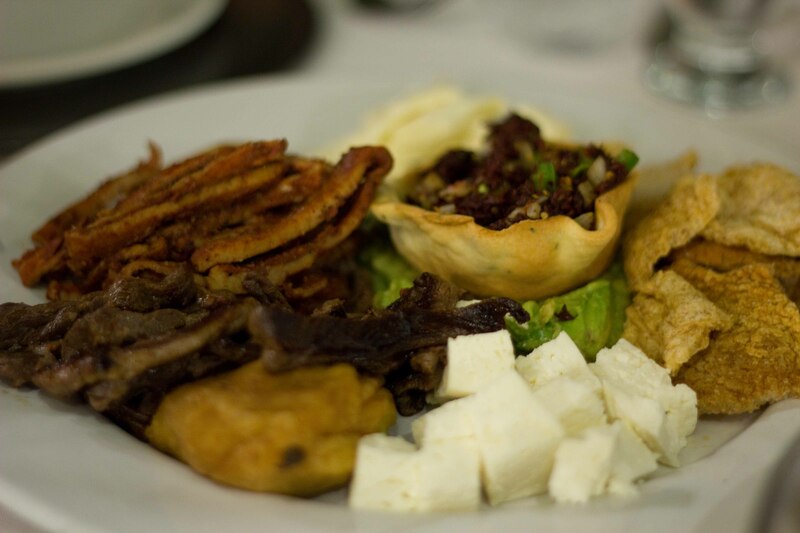 No surprise that my favourite thing on the plate was the chicharrones, (pork rinds). 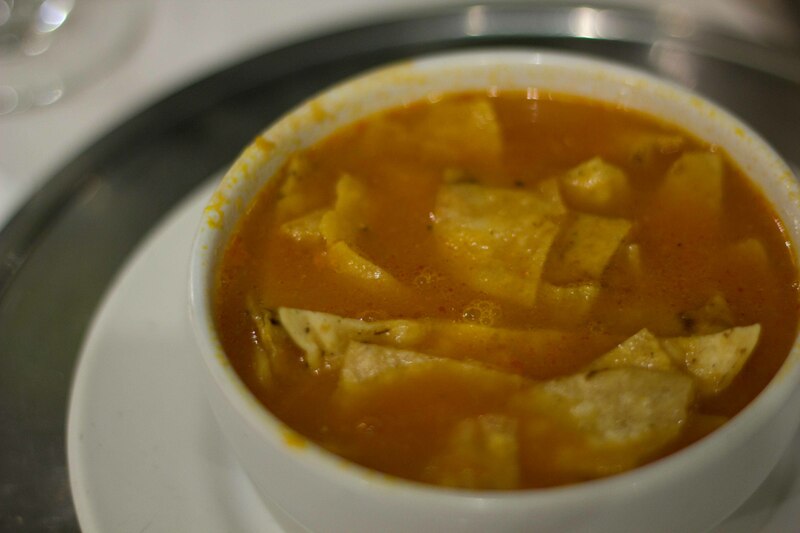 Sopa Azteca aka Tortilla soup is best served table-side so that the tortilla strips stay crispy, (ours wasn’t). I really liked the flavour of the soup though. 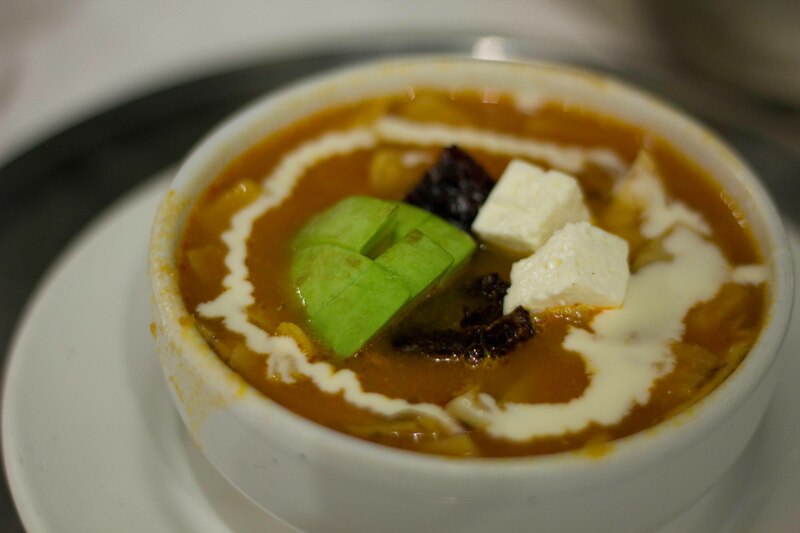 All jazzed up with avocado, fresh cheese, crumbled poblano chile and the most decadent crema. hmm, grasshoppers huh? Well, knowing you, you’re up for the challenge. Everything else sounded great! Can’t wait to read about the mole!